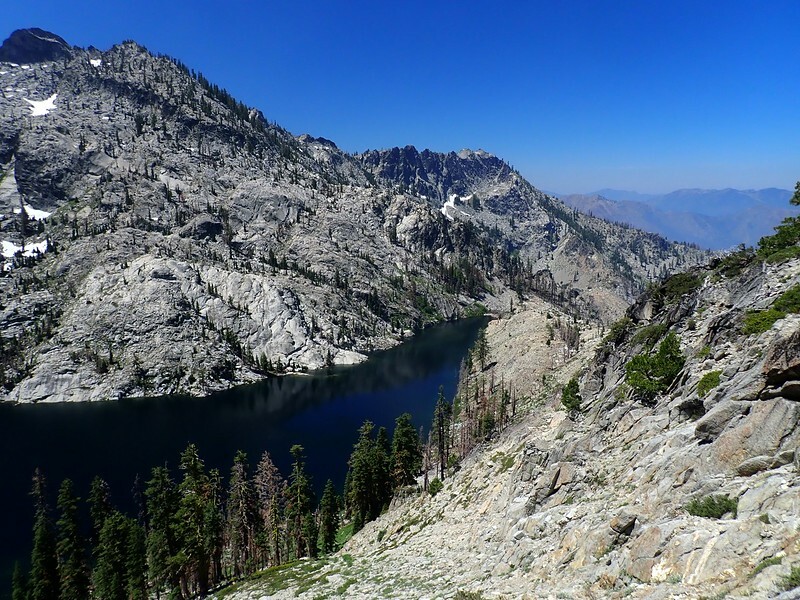 Big Blue Lake is situated at the northern end of California’s Russian Wilderness. 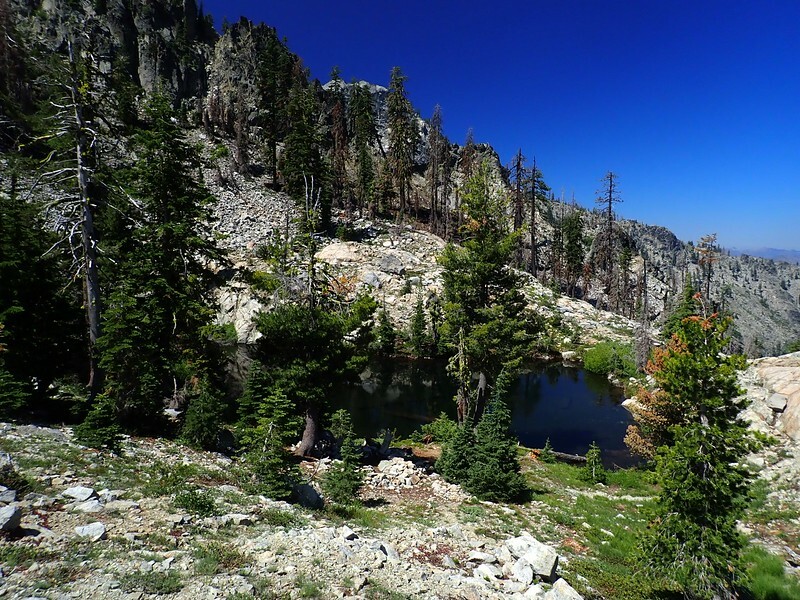 I came across it in Lautner’s Day & Section Hikes, Pacific Crest Trail, Northern California (2010), where reaching it is portrayed as an off-trail adventure hike. And so it was. 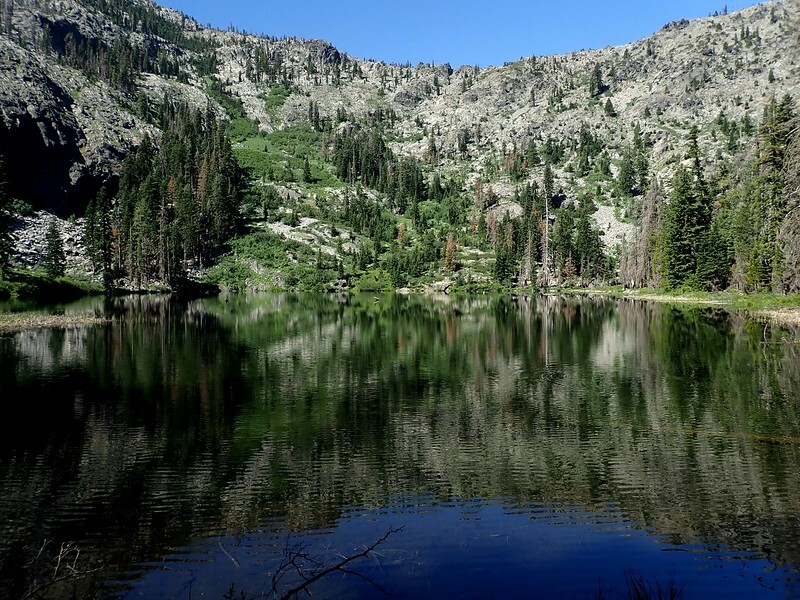 Going cross-country to Big Blue is a lot of work but, once you’re there, it’s an exquisite turquoise blue gem of an alpine lake, set in a rugged granite bowl. 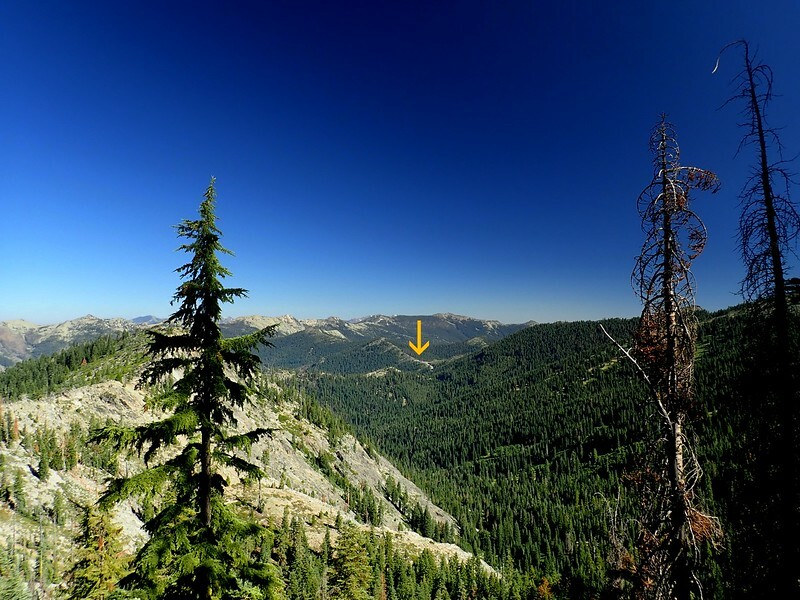 On reflection, it would have been better to have hiked to it on a cooler day and on one where the scenery wasn’t faintly obscured by smoke from a wildfire smoldering some 10 miles to the northwest in the Marble Mountain Wilderness (Island Fire). Ah, hindsight. Leaving the LovedOne still immersed in some sort of fabric project involving quantum physics, I drove south to the Taylor Lake Trailhead off Highway 3 west of Etna, California. I stopped at Etna Summit – where the Pacific Crest Trail (PCT) crosses Highway 3 – to view smoke from the Island Fire filling the valley below. The faint odor of old campfire would follow me all day. Judging from the amenities – a paved parking lot and a pit toilet – this is a popular trailhead. 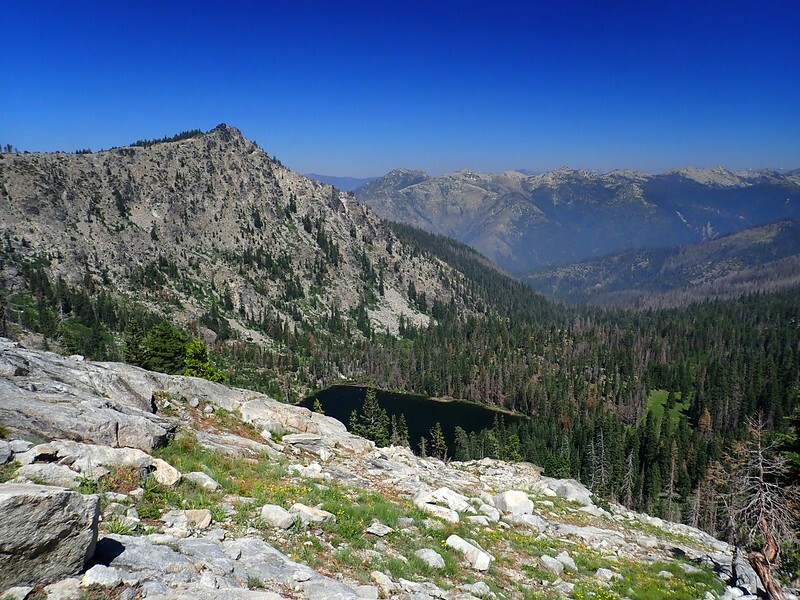 And unlike some recent hikes, this one was not plagued by mosquitos! None! Amazing! 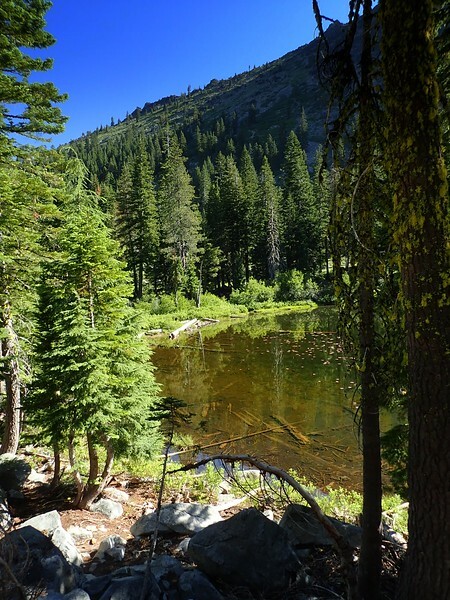 A short walk up the wide trail to the lake brought me to a small homemade sign that pointed the way to the start of the Hogan Lake Trail across the lake’s outlet. 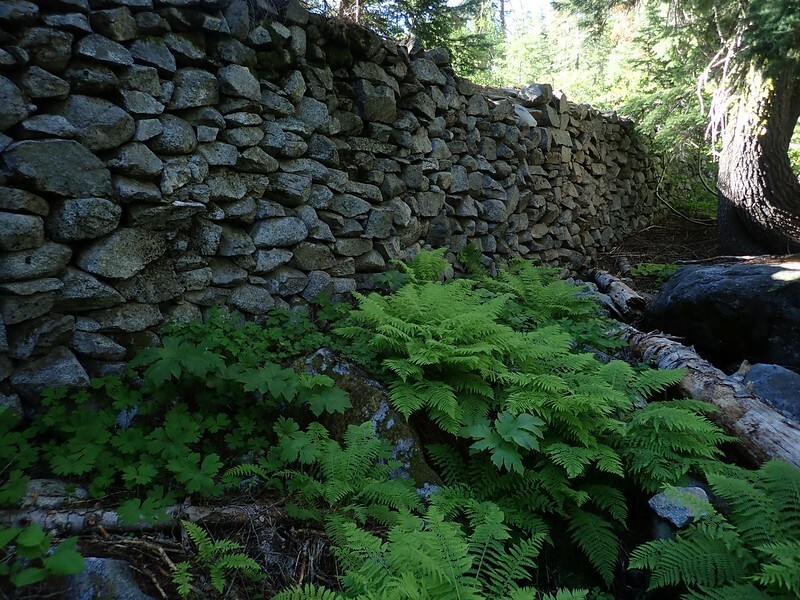 I passed an intricate dry-laid stone dam that suggested that the lake’s depth was not entirely natural. 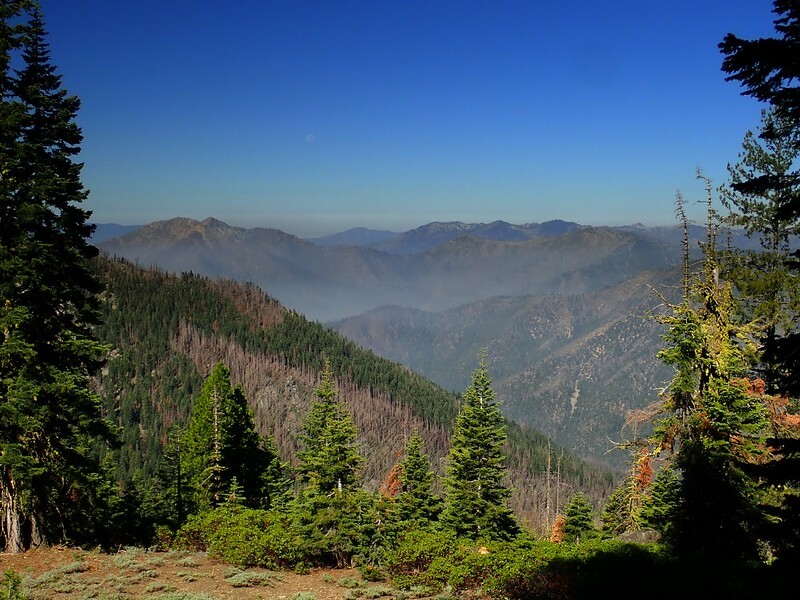 more smoke in the valley to the west, and dead trees killed by the 2014 July Complex Fire. before ending at Hogan Lake. Hogan Lake is a pretty worthy goal in its own right but Big Blue was calling. 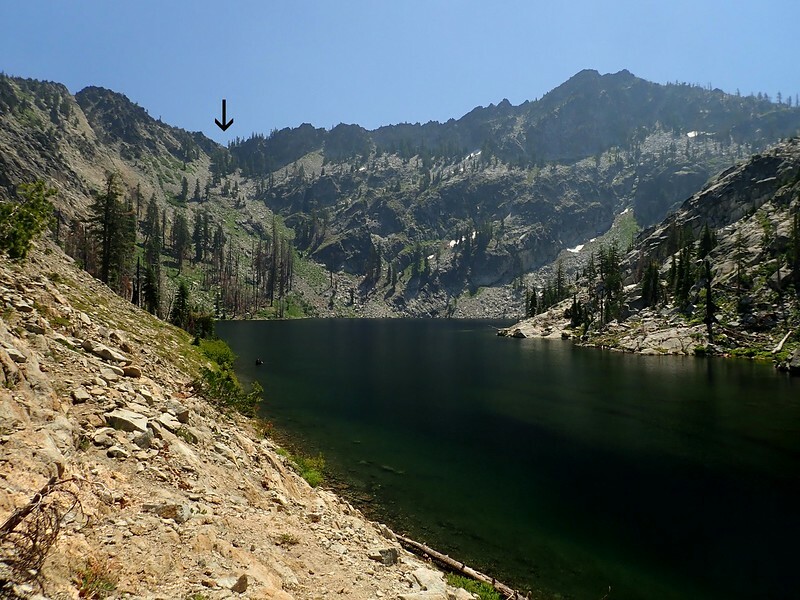 I circled north around the vegetation on the east side of the lake and took the path of least resistance (that is, the least brushy one) up the boulder and dirt slopes above Hogan. 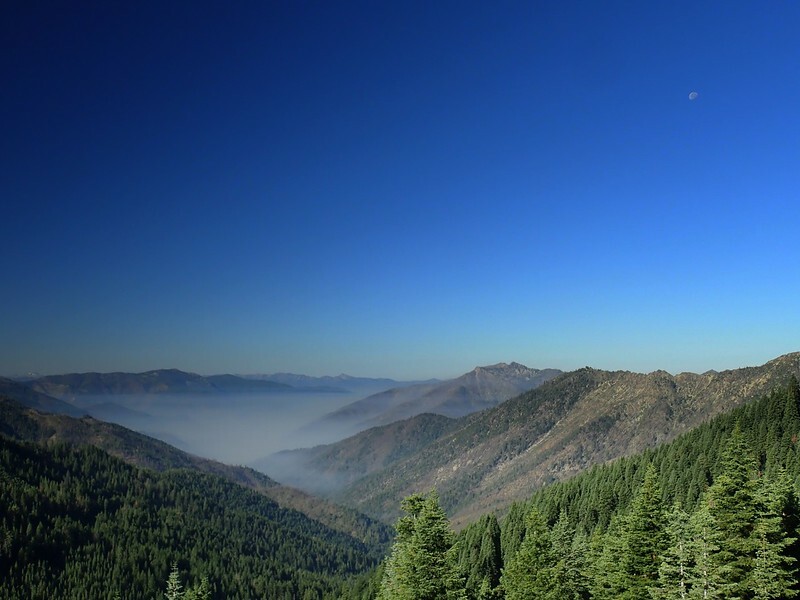 and, shortly thereafter, Big Blue itself – with its apline grandeur somewhat dulled by the smoke drifting up from the valley. The lake is not unvisted as I saw some nice, but small, campsites at its west end and I think some others on its east side. But, given what it takes to get here, I doubt crowds are ever a problem! But wait, there’s more! 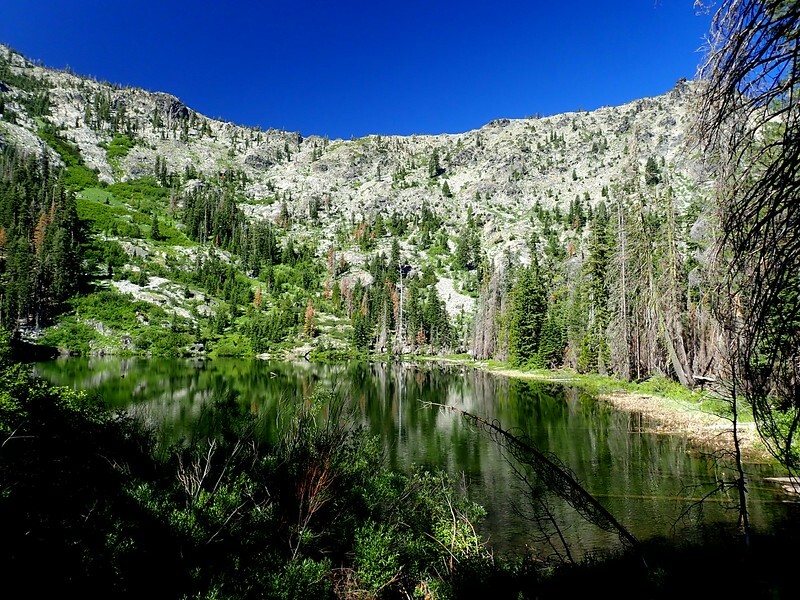 There had been essentially no trail up to Big Blue – a worn tread or a cairn here and there – but there is a good use trail along the north side of the lake, one that I followed to my next challenge – the 600-foot climb to the notch above the east end of the lake. 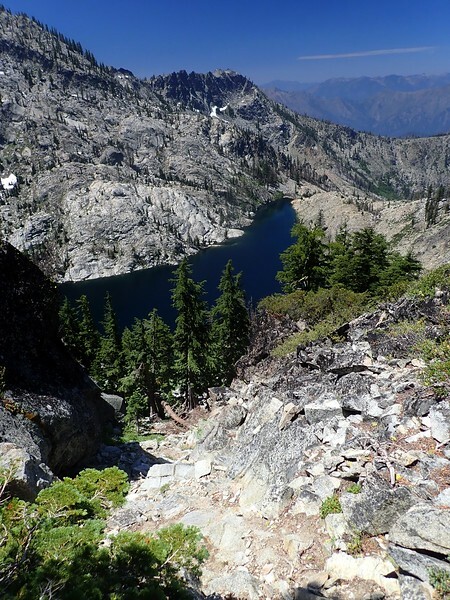 I took a snack and cooling break at the lake because climbing up steep slopes in the hot sun was starting to wear on me. Rather than go to the end of the lake and then head straight up the slope, I started contouring up from about half way along the lake. I have to say that I was really, really happy to finally reach the notch and take another break under the trees in the breeze that was moving over the ridge. Hot, steamy, and sweaty like a used sauna towel doesn’t quite capture my condition at this point. 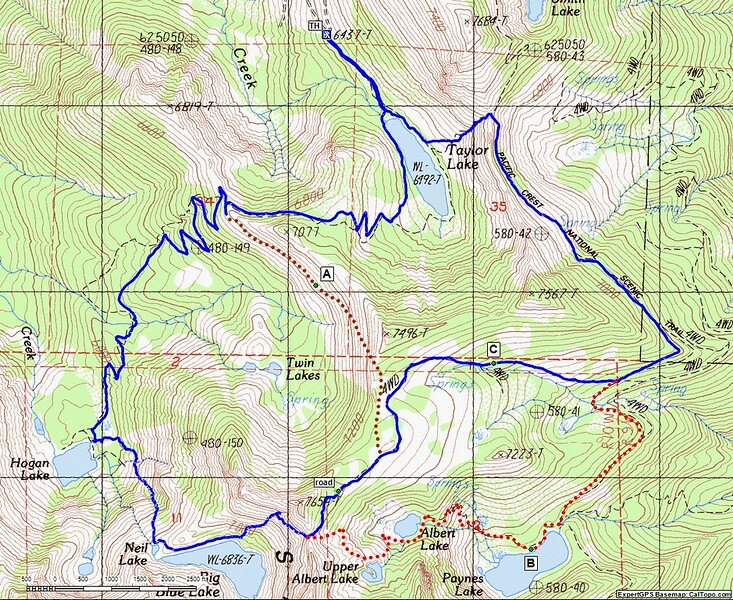 As the sweat dried, I pondered three choices (see map below): (A) find the old road that ends below Point 7654 and follow it to a use trail that goes north back to the Hogan Lake Trail or (B) drop cross-country down the slope to Upper Albert and Albert Lakes and then connect with a trail to Paynes Lake and the PCT or (C) find the old road that ends below Point 7654 and follow it to the PCT. I opted for (C) out of curiosity and expediency – the day wasn’t getting any cooler and my energy levels weren’t soaring. 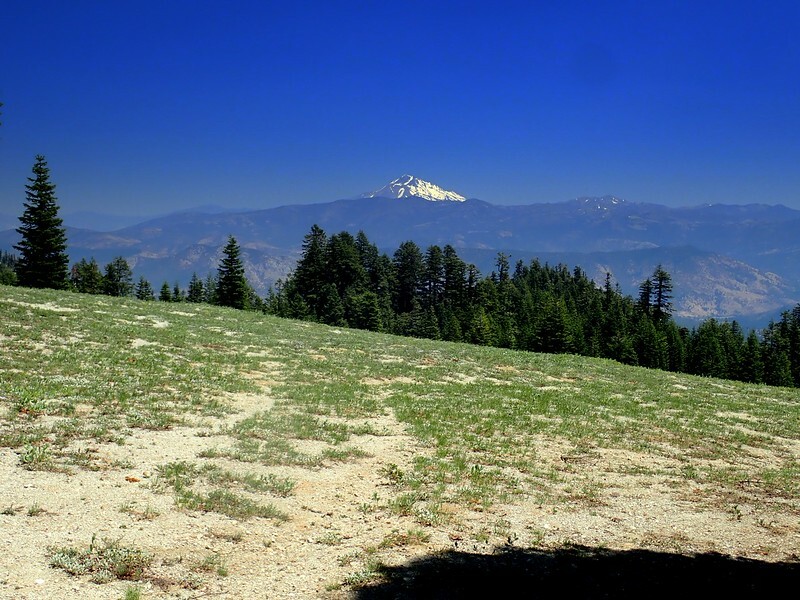 So, after a brief cross-country contour north from the notch, I hit the end of the faint two-track road in a meadow with a big view of Mount Shasta. to notch in the ridge directly above Taylor Lake. 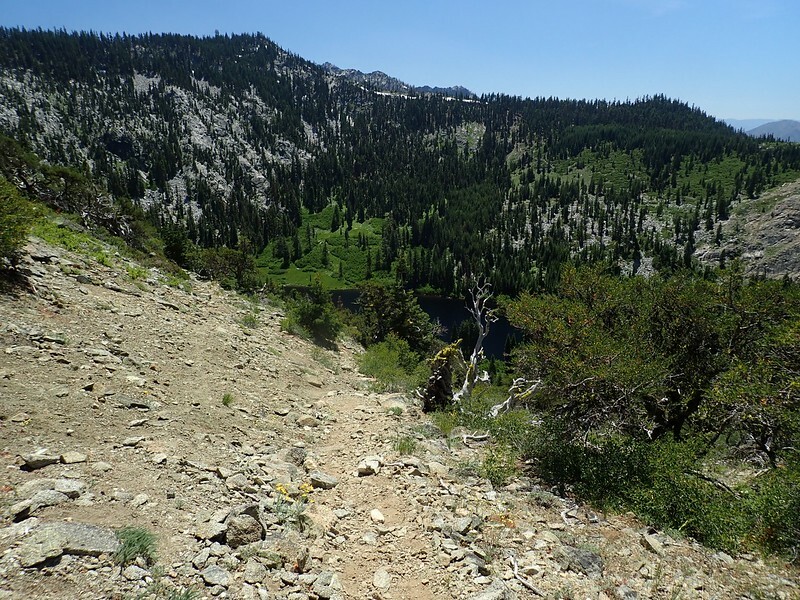 I had steeled myself for a cross-country descent on slippery dirt and rocks but was pleased to find a well-defined use trail switchbacking down the steep, loose slope to the cool shores of Taylor Lake. 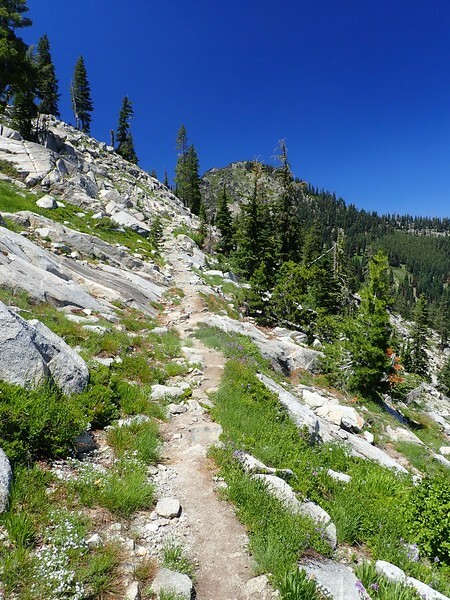 From there, it was a short, level walk back to the trailhead. 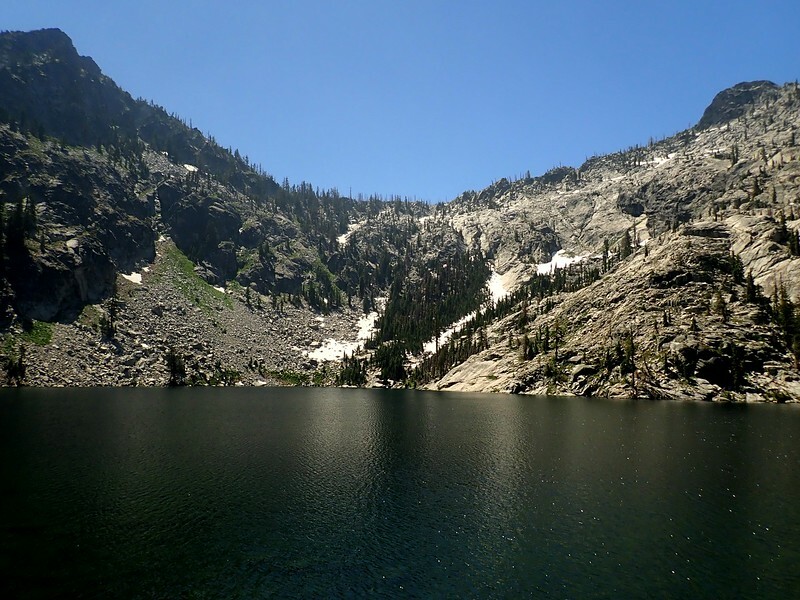 A cooler day and one with less (or no) smoke would have been appreciated but it was still the adventure hike promised, one that took me to some amazing lakes. 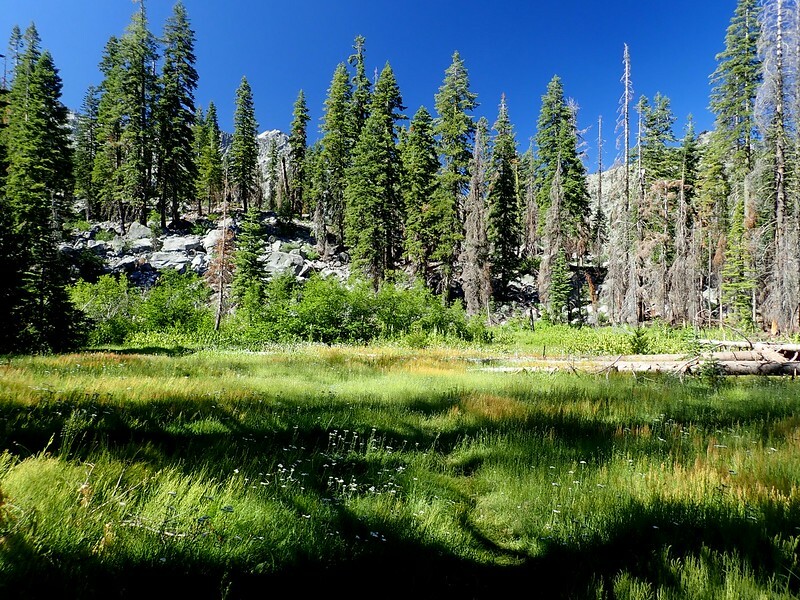 The loop was only 8.7 miles but with 3,000 feet of elevation gain, most of it cross-country over steep, bouldery terrain, it’s still not for hikers (or backpackers) overly challenged by routes featuring scrambling and navigation. Thanks! I wouldn’t have tried it with a 40 lb pack! Thanks! 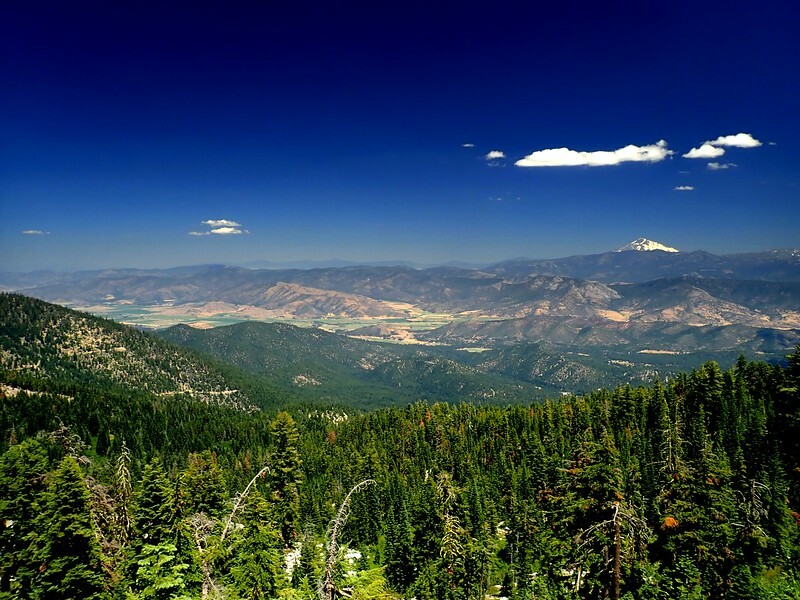 Skies here are pretty blue – particularly at altitude – except when we have wildfires. But I use a polarizer almost all the time anyway – really helps with clouds & sky and also with managing reflections on water.